The most important thing to remember when in conversation with a turner is never let your guard down. You may feel comfortable and safe and that is what the turner is waiting for. 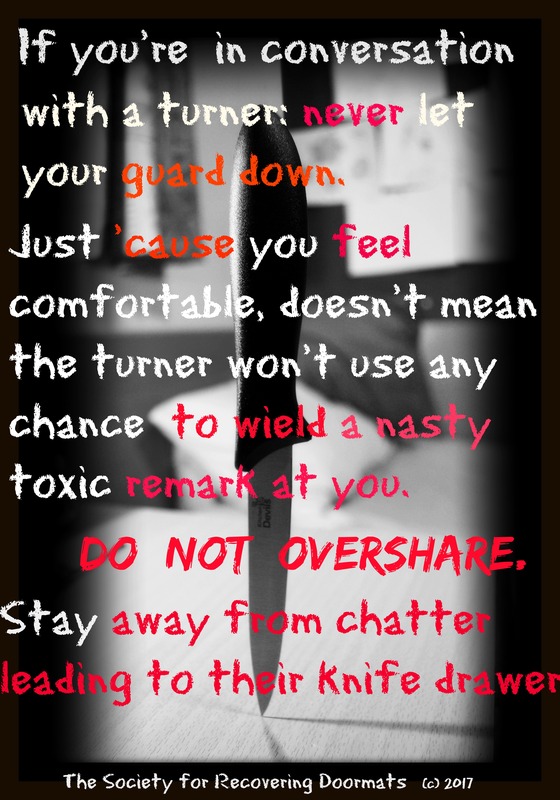 The turner uses your open and vulnerable state as their cue to wield a nasty toxic remark at you. Or say something to undermine your confidence. Or both. And last but not least: do not over-share. Even if you’re in party mode and feeling the love. Unfiltered chatter and TMI can lead to the turner’s knife drawer. They might not throw one at you immediately, opting for another time when they will double their arsenal. Very powerful! So important to be mindful of.